Last weekend I had the opportunity to exhibit my work as part of the Lawrence Final Friday events. Along with a table of letterpress goods and unframed works, I showed two new framed paper pieces and one of my new five-foot-square canvases. These new big canvases are the largest I have painted in over sixteen years, which seems crazy. I believe I gave you a glimpse earlier? I was very excited to show something this new and this scale. Everyone who attended was incredibly supportive and encouraging. I am grateful to my artist friend Kristin Morland for opening her home gallery for the festivities and to Emily Markoulatos, and Raelean Finch who also shared their work. Also I want to let you know that for a brief while, I am running two shop specials. Now through Dec. 9, save 20% on all fine art prints in my shop with coupon code 20print14. 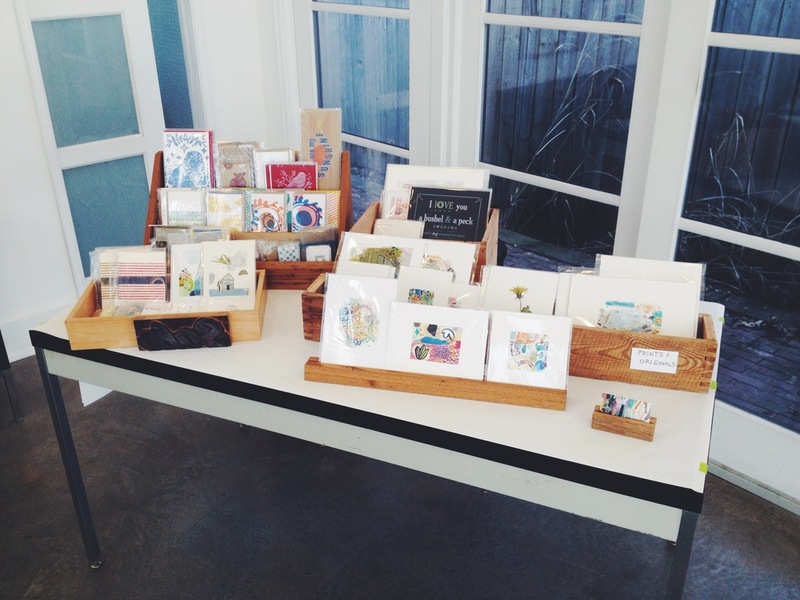 You will also find a few letterpress prints and cards marked on sale. And through December 13, additional letterpress goods are on sale in my pop-up Etsy shop. This afternoon I sent out an end of the year newsletter. Did you receive it? If not, you can view it here. And one more thing, after six years, habit blog is coming to a close at the end of December. I'm very glad to be sharing moments there this month along with so many others who have participated over these years. Thank you Emily, Molly, and Tara for hosting.